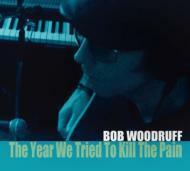 The Year We Tried To Kill The Pain is the critically acclaimed artist Bob Woodruff's first U.S. release in nearly 20 years. This new CD is like stumbling onto something new by Elliott Smith, Nick Drake or Jeff Buckley, only Woodruff isn't dead through no fault of his own. The music played mostly by a group of fine Swedish musicians and a couple of superb players from the States including Benmont Tench, finds Woodruff moving away from straight honky tonk and closer to a rootsy soulfulness that melds rock, R&B and country befitting these songs about love, pain and redemption.